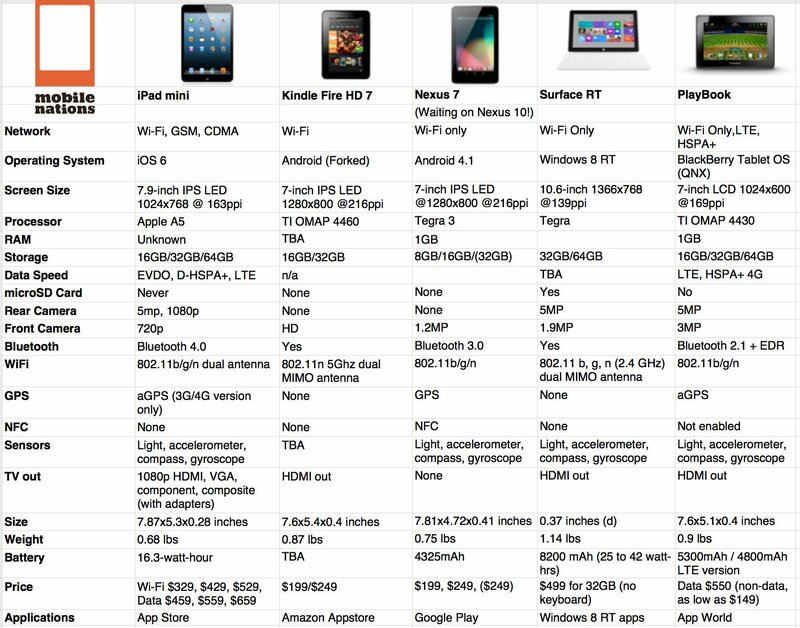 iPad mini vs. Kindle Fire 7 HD vs. Nexus 7 vs. Surface RT vs. PlayBook: Spec shootout! Apple has just announced the iPad mini and that means they've fully entered the small tablet space. Priced starting at $329, however, they didn't obliterate it as some (including yours truly) thought they would. There's now plenty of room under Apple's umbrella for competitors to compete on price. Right off the bat we have the new Amazon Kindle Fire 7 HD, which while more media appliance than tablet, and only available in a handful of countries, is still hugely competitive in that space and in those places. The Nexus 7, which is transitioning from 8G/16GB to 32GB and likely getting cellular is cheaper, but runs more smartphone apps than tablet apps. Still, if that's all you need or care about, it's the best bigger iPod touch on the market right now. Microsoft's Surface for Windows RT isn't really a small tablet but since no small Windows 8 tablets have been announced yet, we're including it here as well. Microsoft's messaging is still confusing and poorly articulated, however, so I'm waiting to see how it holds up and makes sense in the real world. RIM's BlackBerry PlayBook, one of the original 7-inch tablets, is still one of the most interesting. It's reportedly going to be upgraded to BlackBerry 10 next year, and if you look around you can find them for as little as $149. That's a pretty good value proposition if you really don't want an iPad mini. Apple has already sold over 100,000,00 of the 9.7-inch iPads. No one has really cracked the small tablet market though. Will the iPad mini be the first successful, mass market, small form-factor tablet, or did Apple leave enough of a price gap underneath it for a next-generation Nexus 7 or more widely marketed Amazon Kindle Fire to steal ground?